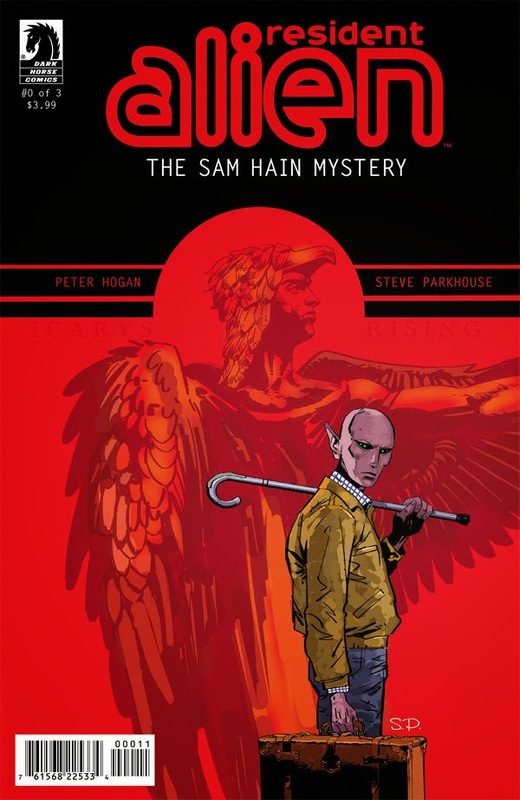 The Fellowship was fortunate enough to obtain a copy of RESIDENT ALIEN: THE SAM HAIN MYSTERY #0 from Dark Horse Comics. The story is by Peter Hogan, with art by Steve Parkhouse. The material originally appeared in DARK HORSE PRESENTS Volume 3, #1 through #3. The alien (posing as Dr. Harry Vanderspeigle) is finishing up his move from the cabin to live in town and closer to his patients. Through a series of flashbacks we see glimpses of his first few months on Earth as well as his home world. Meanwhile the Feds are still trying to track down the mysterious visitor. They may have found a way to locate him…“Dr. Vanderspeigle’s” friend Asta. RESIDENT ALIEN is a much underrated series of mini-series of high quality. Hogan and Parkhouse craft an interesting mix of drama, mystery, suspense with just a dash of sci-fi to make a great tale. I highly recommend this book and the trades collecting the previous RESIDENT ALIEN stories. You won’t regret it. RESIDENT ALIEN: THE SAM HAIN MYSTERY #0 is in stores now, or available for ordering at www.darkhorse.com.